The partial view of the Nokia Theatre seating chart. A Los Angeles based artist and singer selling tickets to her own event on her own website. A round-table, seated, fundraising event in Sydney Australia. Buyer can pick their table on the interactive seating chart. Concordia University Irvine Cu center seating chart on Ticketor for an assigned seat event. Buyer can pick their seat on the interactive seating chart. A London, United Kingdom comedian selling tickets to his assigned seated comedy show. In conjunction with the radio 670AM has been selling tickets to a lot of concerts and seminars. A travel agency and cruise planner. Selling tickets to their cruises on their own website using Ticketor. Thank you, Thank you and in case I haven't said it before THANK YOU for making life easy! September 28th concert was my first experience with Ticketor and I have to say, your professionalism, your availability when it was needed the most, and your accuracy made me look no further for my next event in Danville. It is so amazing. I must say, I am so impressed with the customer service you and your team has provided me. Ticketor Team is like your friend, your assistant and your business partner. They helped us from the set up of website to implementation of strategies is business. Itâ€™s all going well, and I am very excited about the way it is improving our admin systems. I actually feel in control. Some events were fully booked by on-line booking within three minutes of the release time. We have also stood down our telesales team for Sunday coverage due to the scarcity of calls. Ticketor helped us eliminated the need of investors for our events by getting access to the ticket sale money in advance. For us, it means, less hassle and more profit. We love the rates. They are offering a professional service at the best rates in the industry. 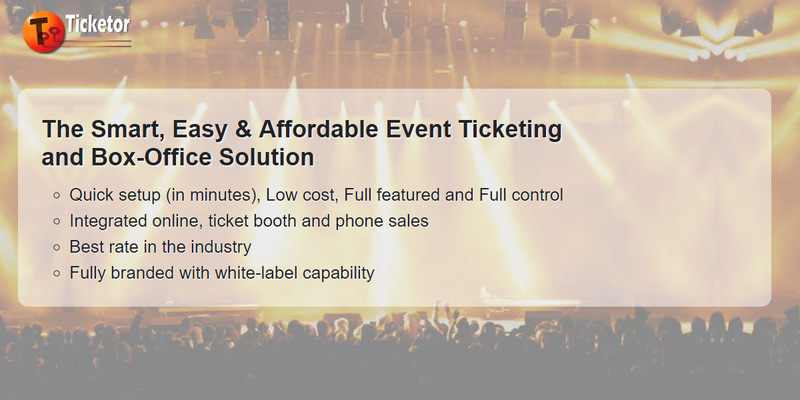 The cost of using Ticketor is much less than the cost of building and maintaining a simple website. The transaction fees are also minimal that we decided to eliminate all the convenience fees. Our sale has increases a lot since then. Great features! Our customers love the fact that they can pick their seats. Easy to use for us and easy to use for buyers. No complain. I have been using multiple services for selling tickets. When I first heard about Ticketor through an ad, I couldn't believe that such a service exists at such a rate! I am happy that they had free trial. Most of the other ticketing services are missing the seat selection feature. It is very important for the buyer. I love that I have full control over my events. I get an email every time a ticket is sold. Printing e-Tickets with my branding and logo is also a big plus! Ticketor has helped me save a lot of advertisement money. After 3 years with Ticketor, my mailing list has a few thousand members. My events sell out just by sending out my weekly news letter. Now I am trying to get more Facebook fans to get more out of Facebook integration. I am not a computer expert but I was able to setup a website in half a day. It was so easy and the customer support was really helpful. Thanks Ticketor. I am making more money from Google Ads than my monthly fee! My website is free.